By Zaufishan Iqbal (New Blog Contributor)– Every week the BBC broadcasts their edgy-undercover program Panorama, which attempts to expose Britain’s fraudsters and fears. On Monday 22nd November, Panorama puked out an episode ‘British Schools, Islamic Rules’, a lengthy report of fears that Saudi-funded schools teach anti-Semitism. As a Muslim teacher and student of Muslim schooling I could not hold my excitement within my hijab, knowing that I was about to be represented as another Arab-anti-social-cult-member. Please enlighten me, BBC, what did those Muslims do now? The video opens with generalising all three monotheistic faith schools. The reporter researched a variety of school websites and found that sadly Jewish schools are “locked into their own world”. Quite shockingly Christian Evangelical schools state boldly they want to “eradicate Islam altogether”, but this is not what the suckumentary focuses on. No, it is the “anti-Western tones of some Muslim schools” which scares the bejeesus out of them. Well, hide your sons and daughters fellow Britons, those Muslims with their war-tones are prowling the streets again! The first Muslim school is under scrutiny. 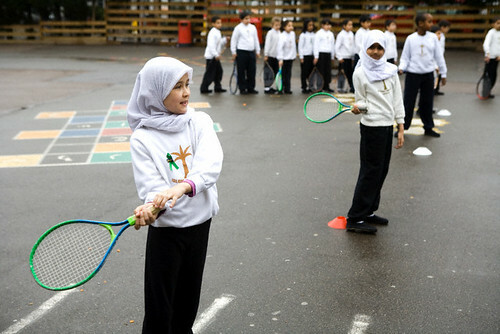 An all-female school in Leicester for which students must wear the niqaab (face veil). Needless to say when you see the sight of black-clad women on television, you avert your eyes lest you fall under such oppression, and your minds ring with “save them! save them!” This is how television works; take the ignorant, feed them ignorance. The niqab has become a symbol of dark connotations and that is the power globalisation has. I refuse this and will refute it. Well, surely this is barbaric and a path of segregation (!) Guess again my freedom-loving friend. In Islam women can move anywhere and commit to any ethical form of work with protection. We Muslim women do not encourage flashing the streets at 2am with alcohol in our bloodstream, but this is not to imply our British women do… Note that the guideline above reads “encourage”, this is not a command to remain indoors. Plus, when Muslim women are on the streets in niqaabs some British people have hissy-fits, if they’re indoors with their families they still have hissy-fits. Here’s a suggestion: why don’t you get on with your own lives? Quotes on Shariah (Islamic law) then arise. Yes this exists as a command from God, it’s not implemented in ‘Muslim Britain’ for obvious reasons. But really, how many times has this been implemented in Muslim schools? Is stoning really on the agenda for the school’s morning briefing? Lets move on. “Music is an evil ploy” is another school-curricular quote and thus the viewer thinks, ‘my gosh, these Muzlims don’t like Jay-Z or Justin Bieber, they must be truly evil’. Here’s the 101 with music in Islam: if it’s not connected to lewd behaviour, raving or immorality, it passes, give or take differing opinions. If some Muslims reject it altogether, that’s their right, if other Muslims promote music, so be it. How this fits into the educating of Muslim students is beyond sense. And I took music lessons too. At a Muslim school. I’m a fan of Shakira, Tupac and The Who as much as the next Islamically educated Muslim. Next we are read a quote on the “kuffar” who are Islam’s enemies (it’s plural). Let me clarify something here. Two words that are perpetuated from the television-Muslim (ie, the only non-English speaking Muslim available for interviewing) are “Infidel” and “Kuffar”. Firstly “Infidel” is a Christian term used for every other non-Christian, which Muslims just so happened to pick up from earlier meetings. And “Kaafir” (singular) applies to a person who knowingly rejects One God, His Prophets and teachings – that person is a dis-believer and is left in the trust of God. “no, God uses it… I would argue that reading scripture out of context is fundamentalism”. Students from the Muslim schools said their “school values other traditions” and teaches them to integrate with other communities. So, Panorama looked for drama elsewhere. John Bald, a school inspector, said more effort was needed to “look at [the] contradictions” between what students said and what their schools advocated. Aha, drama found. Apparently another Muslim school website included excerpts from speakers along the lines of “we must defend our children to the forces of evil”. Well yes, I would like to think any parent would protect their children against evil such as knife crime and MTV too. Where does it say such and such a school is anti-West? What West? In the accent of Mel Gibson’s Braveheart, “arr yu tryn’u pikk a feight?” And there is still the point of anti-Semitism which the whole report is based on. Panorama goes on: In ‘Islamist’ schools (much love for the b*st*rdised English language) Muslims are told celebrating birthdays is forbidden. And how does this affect our integration in Britain? Are Muslims holding anti-celebratory demonstrations? Are Muslims cancelling their own Eid? Are these Muslims gatecrashing your proms and parties? Next. Riyad ul-haq isn’t being anti-Semitic. This is what the God of the Muslims, Jews and Christians said. Granted, perhaps you wouldn’t open with God’s wrath to every beautiful Jewish friend you were introduced to. And I repeat, none of the reported Muslim schools produced students who came out chanting anti-Semitic slogans. If anything, rational Muslims have set up organisations in defence of Judaism, such as Muslims Against Anti-Semitism. Another quote from a school’s curriculum read “Do not befriend the kuffar”. The Qur’an says this slightly differently. So we are back at the original meaning of disbeliever and what it takes to become worthy of that title. If Christian schools wish to “eradicate all of Islam”, and Jewish schools do not acknowledge others, which is the worst from all three? In Islam to “not befriend the disbelievers” is not misquoted but is misunderstood. Muslims can befriend anyone they like and must respect everyone. However, when a person openly hates you and wants you dead, when they threaten your life, your family, your freedom to live and worship your religion, do you really invite that person as friends to your forbidden-birthday party? I didn’t think so. And that is the enemy God warns about. Xenophobia on the other hand is a different issue to schooling altogether and neither Riyad ul-Haq or any of the Islamic schools taught this. Strangely though, 18 minutes into the episode Panorama swipes to the 2001 Oldhams riots, which are completely unconnected to Muslim schooling, and are not a result of anti-Semitism. This is very sensationalist reporting by the BBC. School inspectors in the report claim Muslim schools are vulnerable to “residential segregation”. Dude, this “apartheid” is bloody everywhere. Go into any low-performing Asian-English secondary school and check the natural apartheid that exists in the younger years. This is a mental barrier that society, society teaches our students. And it takes an encultured teacher and a few months of socialising to remove that barrier from students’ interaction. On the plus side the report states that British government supports faith schools. This is no surprise to me. In my final year of Islamic education the secondary school was government funded and had a purpose-built brand-spanking-new building built with a fairly large prayer room facing Makkah. It was not the first government funded faith school and it won’t be the last. So it’s not so much the government which has stomach cramps as it is the schooling authorities, media and Ofsted inspectors. If you don’t know, OFSTED are a regulating body that inspect the quality of British schools’ education and nurturing and grades overall education from poor to outstanding. The secular school I attended had a succession of “poor” results, even the headteacher had given up. This particular school employed Muslim teachers and was strife with anti-Islamic propaganda. In a strange twist of events, a Jewish headteacher stepped in and revamped the whole place, but schooling was still …poor. But I still love Moses’ people. Incidentally the Muslim school I attended was rated “good” and for the past decade has received “outstanding” reports. This school also comes top in the league tables of school GCSE results. Oh, you can just hear the haters burn. Metaphorically speaking! Self-policing schools who opted out of Ofsted reporting are depicted by Panorama as deficient and in need of the inspecting “regime”. That somehow government inspecting is supreme and God’s law is a moronic implication. Muslim schools govern themselves quite well without interference, thank you very much. I can dare to say one of the primary reasons governments step in to fund faith schools is for good publicity. Further disliked statements from Saudi’s school books included that other than Islam, all religions are false; anyone not a Muslim, goes to hell; that Shariah law for theft is to amputate a hand; that homosexuality will be punished. I’m not going to deny these facts as they are included in Islam’s law system, but how, and why, and where? These are the important situational contexts that are neglected by all of us, Muslims included. However, these laws are mirrored in Christianity and Judaism – homosexuality, theft and disloyalty to God is not tolerated. Above all, the Shariah is a universal system of lifting oppression and directing people towards God, therefore if these laws cannot be implemented for everyone equally, they are not applied at all. To conclude, as a Muslim teacher and Islamic student I re-learn important facts from the media: It does not matter whom reporters are able to turn into boogie monsters for viewers; it does not matter how far the current double-father led government destroys the British education system (Lib Dems lied to us about student fees). It does not matter how many times a BNP member is charged for preaching religious and social hatred for anyone who isn’t “pure white bred”, and it does not matter how religiously the poor tabloids blame war, wages or the weather on the Muslims. What matters is as Muslims we are not representing ourselves in fields of professionalism when we have the skills and know-how. What matters is as British Muslims we expect someone else to defend our Muslim students, our niqab-wearing Muslim teachers, our Muslims schools and we wait in false hope for Superman the messiah to spread the correct truth about Islam’s relationship with the West. The British education system belongs to the people of Britain. The people of Britain are not one category or demographic. The problems with the current education systerm are that it’s being undermined once again, teachers are overworked and underpaid, and while maniac students are set free to reap ASBOs on earth, worthy students are thrown around as though it were a custody battle. The BBC investigation assumes “hate is on the curriculum” for all Muslim schools which as an assumption, does not hold water. There are major problems in all British schools such as poor standards of education for low-ability children, students with health or mental problems are not a priority, and racism in the playground still exists. Side-sweeping faith schools as the main reason for social segregation is not true, as Ed West stated, it is a product of society as a whole. And while the program highlighted dangers in xenophobia from Saudi-funded schools, I refute that with the Islamophobia held in the minds of current state school teachers, the mainstream news channels and the defective government. And so help me God, I will not stand for any of it. This was a very good article. I go to a Muslim school and it’s cool, we have more freedom and Islamic facilities than other schools. @School student – we’re glad to hear from you. Perhaps you too could shed light on the pros/cons of Muslim faith schools. Yes the BBC has many issues with muslims of Pakistani backgrounds. Why do they blame thieir enitre failures on muslims? is it our fault that white Brits have turned their backs on Christian values? were churches have become night clubs, apartments and indian restaraunts? surly there are enough problems wihtin the white working clss communities such as teenage pregnancies, drug abuse, domestic abuse, gang related issues, poor quality of education. BBC along with Channel 4 have a personal issue with Muslims which gives EDL more reson to smash our peacful towns with their hideous protests. You are actually defending a school that encourages women to stay at home as much as possible. One of the most scary things about islam is how it reduces womens participation in the public space of society (and thereby gives men the socioeconomic power of a society). You cant see how twisted it is to encorage women to stay at home? Stoning doesnt happen at british schools? Great…so that must mean its ok to teach children its an ok punishment in an islamic state then? NO! And teaching kids that its criminal for homosexuals to have a sexlife. What a great idea in a society you share with homosexual people.